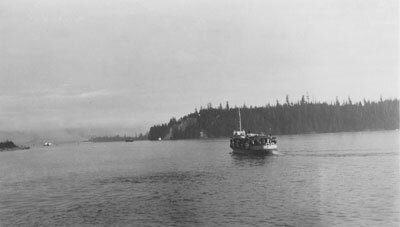 View of the Sonrisa West Vancouver Ferry heading towards Stanley Park and Vancouver. Note on back of photo reads: Lighthouse on left is Capilano Lighthouse which at this time was operated by Mrs. Harris ("Ninny") who was Mrs. C.J. Kendrick's aunt.